We promote conservation subdivisions. 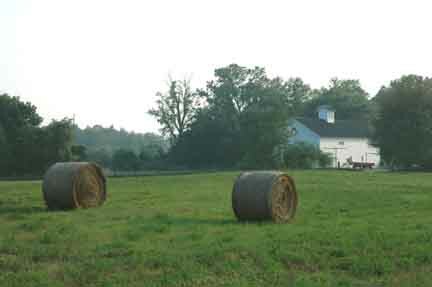 Tryon Farm (IN), above, preserves almost 3/4 of the property, 120 of the 170 total acres. LandChoices is the only nonprofit advocating for a better way to create neighborhoods nationwide through innovative natural neighborhoods (conservation subdivisions). These preserve natural areas, water, wildlife and working farmland. We are also working to save the Boy Scout, Girl Scout and outdoor camps you cherish before it's too late. Top 10 ways to preserve land and water in your community. "LandChoices' efficient media strategy of delivering critical land protection information to targeted landowners and communities inspired me to invest..."
"In these days of green car initiatives and green housing ambitions, Manecke asks, "What about green neighborhoods?" Kirt Manecke thinks he has that better way...for every beautiful place in America that's slated for development.